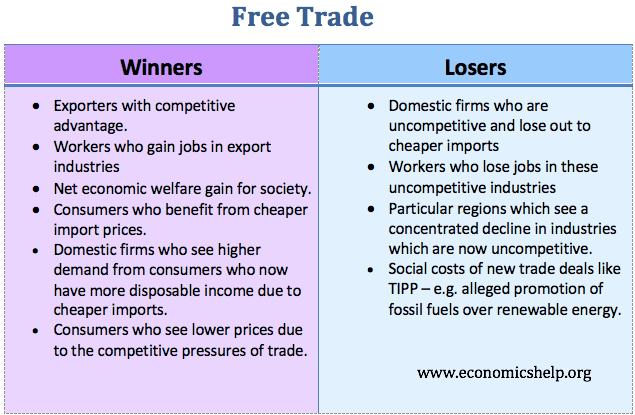 Home > Economics help blog > economics > Who are the winners and losers from free trade? Who are the winners and losers from free trade? Readers question: Who are the winners and losers from free trade? Free trade means that firms can export and import goods without tariff barriers. Free trade leads to lower prices and increased exports and imports. Economists are generally agreed that free trade leads to a net gain in economic welfare; as a result, economists generally support free trade. However, these gains may not be equally distributed. Also, though there is a net gain in economic welfare – there can be groups of individuals who lose out (e.g. uncompetitive firms who close down. There are winners and losers from free trade. Exporters. The removal of tariff barriers will enable competitive firms to export more. This will create jobs in the export sector and increased production for these exporting firms. Firms can specialise in niche production and export around the world. This increased specialisation can enable economies of scale as the firm can produce for a global market rather than just domestically. New trade theory, states these economies of scale are one of most significant aspects of free trade. Consumers benefit from lower prices. Free trade reduces the price of imported goods. This enables consumers to enjoy increased living standards. After the purchase of imports, they have more left over income to spend on other goods. Free trade can also lead to increased competition. Domestic monopolies now face increased competition from abroad. This competitive pressure can reduce prices for consumers further. Domestic firms. If consumers benefit from lower prices, then they have increased spending power. Although not particularly obvious and visible, indirectly other domestic firms will see increased demand from lower tariffs and the higher disposable income of domestic consumers. Increased economic growth and tax revenue. Trade liberalisation can have benefits for economic growth, which will lead to increased tax revenue and increased funds for spending on public services. Uncompetitive domestic firms. Tariffs are often designed to protect domestic firms which produce at a higher cost than international competitors. With free trade, they will see a fall in demand and could go out of business. Workers in these uncompetitive industries could lose jobs. If free trade leads to a sharp shift in domestic demand, old exporting industries may close down, leading to jobs losses. A visible cost of free trade or an inevitable consequence of economic progress? Negative regional multiplier effects. Free trade may affect particular industries concentrated in particular regions. If a region suffers job losses and lower production, then there will be a negative regional multiplier effect which will cause higher regional and structural unemployment. Though net economic welfare for the whole country may increase, some regions which relied on old exporting industries can struggle to adapt to new economic demand. 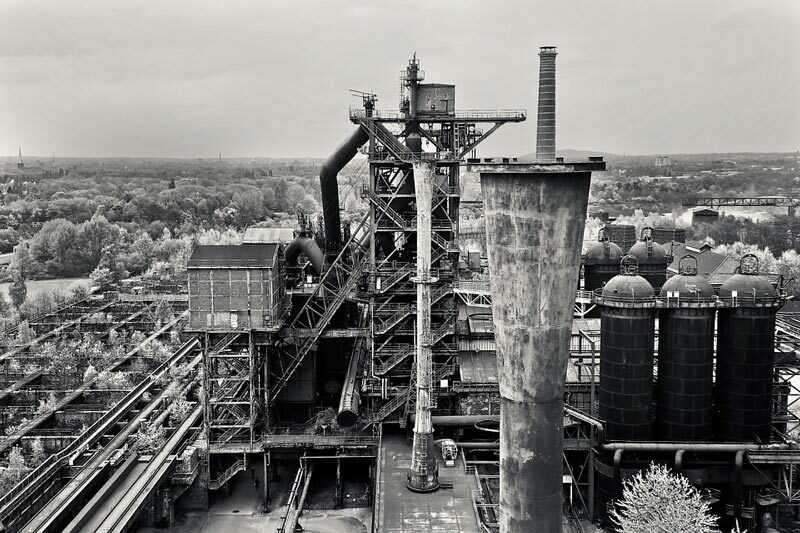 This can be seen in areas like the US ‘Rust belt’ and parts of the UK which experienced a rapid industrial decline. Potential environmental costs. New trade deals like TIPP venture into more areas than just tariff reduction. They include laws which enable firms to sue governments for loss of profit from regulation and can ignore social costs and benefits. For example, Europe has subsidies for renewable energy. However, free trade deals could put fossil fuels on a level playing field to renewable energy; this ignores external costs and benefits. Free trade can have environmental costs. Why is free trade more popular amongst economists than general public? A big issue is the visibility of losers and winners. If you work for an exporting industry which is threatened by free trade, you will be quite vocal in opposing free trade or at least seeing the potential cost. However, domestic firms which benefit from a marginal increase in spending related to lower tariffs may not even make the connection. Even for consumers, lower prices from free trade are not that visible. If there was a banana war and prices increased 20%, it is not a major economic cost – many consumers would not even notice. But, if you know someone who loses a job in an old uncompetitive export industry – this is very visible. If a large steel firm closes down because it is international uncompetitive, then the 500 job losses could make national news. In the long-term, new kinds of jobs will be created, but these new jobs will not make national news. They are less visible. This entry was posted in economics. Bookmark the permalink.